If you’ve been a gamer at all for the last decade or so, you’ll know that the Assassin’s Creed series has had its fair share of ups and downs – marred at times by inconsistent storylines and game-breaking glitches. It’s somewhat remarkable, then, that Assassin’s Creed: Odyssey, the latest adventure in the series, is the finest one yet. It’s a wild, breathtaking romp through the islands of ancient Greece, both visually dazzling and incredibly complex. So, yes, it is well worth your hard-earned dollars. 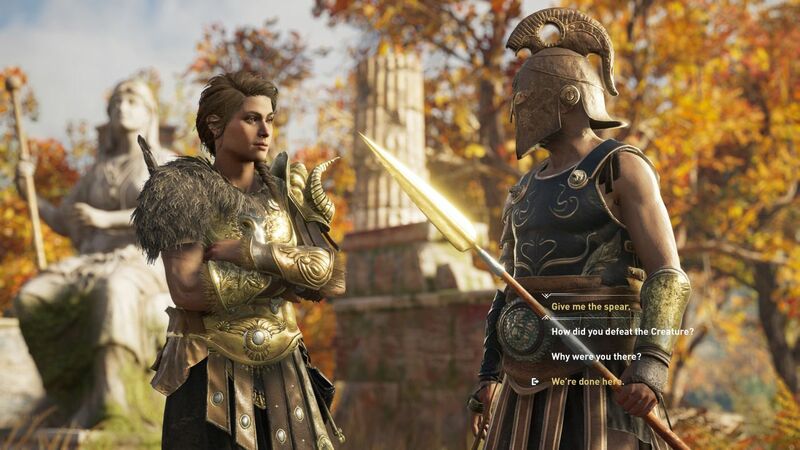 Odyssey brings with it a lot of different changes to the series’ tried-and-true formula, and perhaps the most major change is that you can choose between a man (Alexios) and a woman (Kassandra) for your full playthrough. I picked Kassandra as my avatar for this runthrough, and she is amazing – she’s a fully voiced, emotive protagonist. One who is all at once young and energetic, and that energy really bleeds through into her movements. When the story begins, she’s helping out her adoptive pater figure Markos, only to uncover some information about her true parents that sweeps her off to the rest of Greece. Kassandra soon finds herself in the middle of the Peloponnesian War between Athens and Sparta, and as you might imagine, she has no issue with indiscriminately killing scores of people on both sides – and looks good doing it. If there’s one thing I noticed after a while, it’s that this game is a sprawling epic, much like its namesake Homer’s Odyssey. I played around on Kephallonia for about three hours to start the game, getting familiar with Kassandra and her various weapons, and when I finally left the island, the game’s logo popped up – implying that all I had done was a prologue of sorts. Truthfully, this scale can be somewhat intimidating, but it’s also nice to know that it’s not a quick run-through. Instead, it’s something that gamers can really sink their teeth into. The series, amazingly enough, has gone from a stealthy action-adventure joint to embracing the idea of RPG mechanics, and it’s never been more interesting to inhabit the world of the AC series. 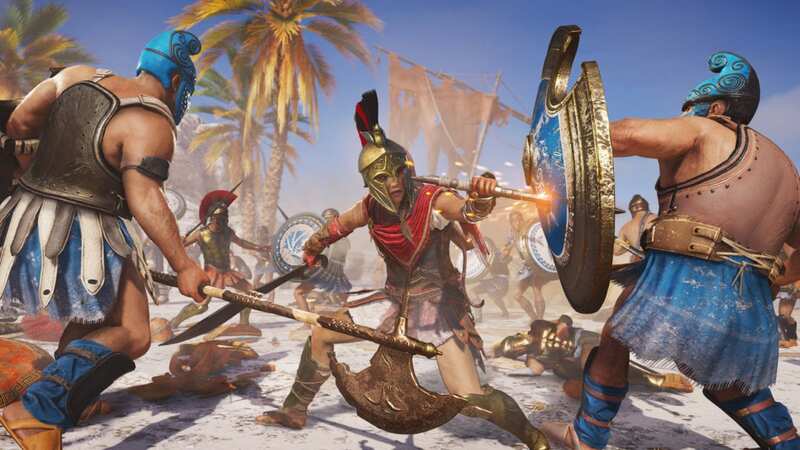 After every level gained, the player can use Ability Points to improve Kassandra’s repertoire of combat skills, including ranged, melee, and Assassin-based talents. Want to feel like King Leonidas in 300? Improve the ‘Spartan Kick’ ability. Want to control the flight of your arrow after you’ve loosed it – you can do that too. Every possible pathway for the type of playstyle you prefer is there, and it’s all fully customizable. Further diving into the idea of RPGs, Odyssey also allows Kassandra to choose from conversation prompts when speaking with other characters. There are hundreds of lines of dialogue, most of which are optional, and there are a number of branching conversation paths to take with each unique character. Little icons next to certain choices indicate what will happen as well, ranging from lying and sarcasm to direct and even options that will lead straight to combat. Kassandra (and I’d assume Alexios, the male character) also has the ability to romance other characters, although they’re mostly passing flings, as opposed to a full game-length romance. Choices made in earlier conversations can – and often does – come back in unforeseen ways later on. For example, I made the choice to save a family from being murdered just because they had something called ‘blood fever’. Their entire village had been burned down so I chose to spare them, but later on I learned that the blood fever, thanks to them, had spread across a whole island. I could almost see Kassandra do a face-palm. Evidently, it’s important to make your choices with care. 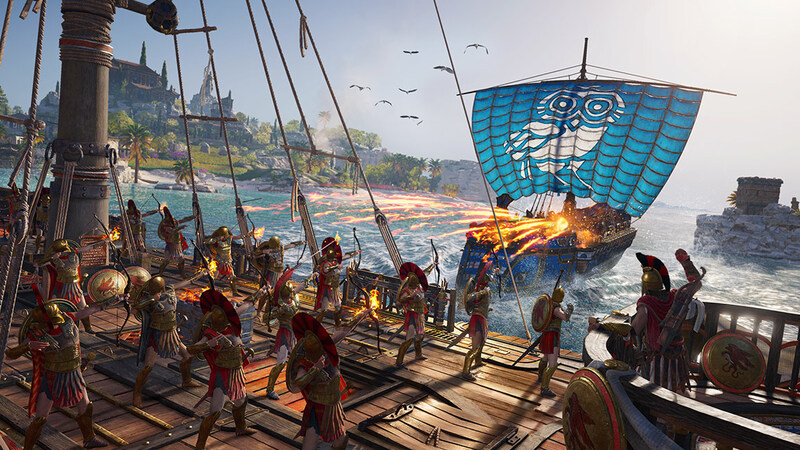 Combat-wise, at its core, Odyssey still has a heavy dose of stealth as you murder your way through the Greek countryside. It’s often far more entertaining to plot out how to infiltrate a fort or camp undetected, getting in and out without being seen. Combat in general is a blast, though I found that Kassandra was at her best when she could move in for a quick strike and retreat to the shadows, as opposed to wading into a brawl with five opponents. Whenever Kassandra arrives in a new province, she has the ability to aid either the Athenians or Spartans in their fight against one another. She’s provided with a number of objectives: take out a politician, assassinate a military commander, steal treasury supplies, burn food for the opposing army’s troops, or any number of things. Whenever she accomplishes one of these objectives, she weakens that nation’s hold on the region – when the nation’s rating is low enough in that region, Kassandra can trigger (and subsequently participate in) a Conquest Battle to seize that area in the name of the opposing army. Since she’s essentially a gun-for-hire, Kassandra can work for both sides at any given time, leaving you with plenty of opportunities to get your hands dirty (and to rack up that sweet, sweet XP). Another fantastic addition is the Mercenary system; as you engage in your various activities throughout Greece (most of which involve murder of some sort), it’s possible that you rack up some bounties on your head. Now, it’s possible to simply pay them off (conveniently located through the menu screen as opposed to going to a location in the game itself), but the more entertaining option is letting the mercenaries/bounty hunters come to you. By eliminating them one-by-one, Kassandra can move up in the mercenary world, gaining some name recognition herself. They’re harder to kill than your average guard, but the rewards are much greater. Ever since Assassin’s Creed: Black Flag, Ubisoft appears to have realized that one of the most iconic moments of the series has nothing to do with being an assassin at all – it’s about being a pirate. Yes, ship combat returns in Odyssey, as you can pilot a trireme capable of taking down other vessels and boarding them for treasure (and to refill your ship’s own health). As a side-note, am I the only one who enjoys screaming ramming speed as you charge right into a fleet of enemy ships? Only me? Okay, then. Visually, the game is absolutely stunning. There are several vistas in the game that legitimately made me stop and simply pan the camera around – they could be postcards for Greece’s tourism board. Whether it’s the glistening water as your trireme cuts through the waves, or synchronizing a viewpoint atop a statue of Athena, everything looks beautiful. Odyssey still carries some issues, which chiefly have to do with the game itself. While there is nothing quite Unity-level in terms of game-breaking bugs, loading screens are incredibly long, and more than a few times my game crashed when coming out of a cutscene. This might be something that gets patched by launch day, but it was something to be aware of given the history that the AC games have had to endure when it comes to bugs. In addition, within the game, the Animus ‘real life’ story is again painstakingly boring. I get the sense that Ubisoft is aware of this, however, and admittedly endeavours to minimize those parts as much as possible. While the game isn’t truly an ‘open world’ (you can go anywhere, but area level limits mean that you will encounter a swift, unforgiving death if you go somewhere that you’re not ready for), it still feels lovingly lived in. You can speak with almost every character, all of which have unique lines of dialogue, and all of which range from funny, sad, acerbic, mean, joyful, and everything in-between. Assassin’s Creed: Odyssey is a detailed, unique, ever-changing world, and it’s a blast to play around in. Assassin’s Creed Odyssey arrives for Windows PC, PlayStation 4, and Xbox One on October 5, 2018. Ubisoft Canada provided Okay, Cool with a code for the game on Xbox One for coverage purposes. You can find Sho on Twitter at @SNSAlli if you want to pick his brain about Assassin’s Creed Odyssey… or, you know, just want someone else to be a nice person towards.